About 60 people had the opportunity to share their thoughts on Common Core to lawmakers during Thursday's legislative meeting. 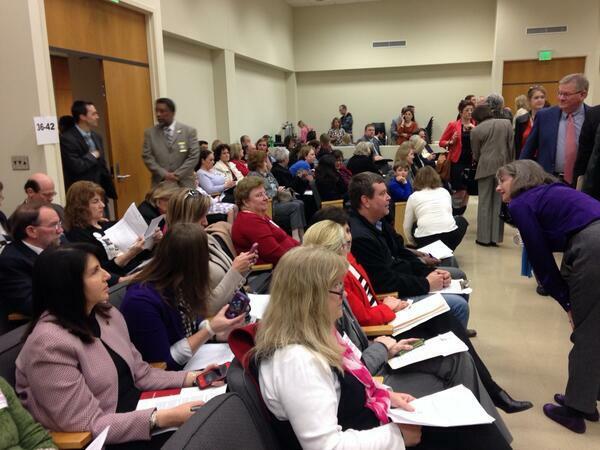 Dozens of parents, teachers and education leaders expressed their strong opposition and support of Common Core Thursday to a group of lawmakers considering whether to repeal or revamp the new educational standards. The state adopted the standards in 2010, but they were implemented in public schools last school year. The standards lay out what students need to know and be able to do from kindergarten through high school. Common Core has seen a great deal of backlash in many of the 45 states that have adopted the standards, prompting leaders to consider withdrawing or delaying use. In North Carolina, lawmakers created a joint legislative committee that is studying the issue and will likely make recommendations on its implementation. The committee heard from about 60 members of the public Thursday, many of whom strongly oppose the Common Core standards. “It's causing anxiety, confusion and is a disaster for these kids. We're the ones witnessing this, in the classroom, with our children,” said Andrea Dillon, a parent of a child in Wake County Schools. Dillon, like many other critics, say the new standards are too demanding on students in the early grades and encourages a “one-size-fits-all” approach. Opponents also argued that Common Core is an attempt to nationalize or globalize education in a way that takes control away from the state. Many supporters of the Common Core included teachers, who say the new standards promote critical thinking, instead of rote memorization of facts. “Because of the previous standards were not as rigorous or as challenging, I – like many teachers – was guilty of not pushing my lowest-performing students enough,” said Karyn Dickerson, a Guilford County English teacher and 2013 Teacher of the Year. Nancy Gardner, an English teacher in Mooresville, says she wants her students to master what she considers the “heart and soul” of the Common Core literacy standards. “Problem-solving, critical reading and writing and perseverance, “ she said. “My students can Google facts and figures all day, but if they haven’t mastered literacy skills, they won’t be ready for the future. Katherine Pardue teaches 6th grade at Guy B. Phillips Middle School in Chapel Hill. She's one of many teachers across the state who are beginning to use new strategies in the classroom as a part of the newly adopted Common Core curriculum. What Does Common Core Look Like Inside A Classroom? As she wraps up class, fourth-grade teacher Rosalyn Bailey walks by each table, hovers over each child and points at the math assignment. “What’s two-tenths plus four-tenths?” Bailey asks one of her students, who responds with a wrong answer. On the other side of the room, nine-year-old Ken is one of the few students who have a better grasp of the material.